“Dermatologic surgery” redirects here. For the journal, see Dermatologic Surgery (journal). Attested in English in 1819, the word dermatology derives from the Greek δέρματος (dermatos), genitive of δέρμα (derma), “skin” (itself from δέρω dero, “to flay”) and -λογία -logia. Readily visible alterations of the skin surface have been recognized since the dawn of history, with some being treated, and some not. In 1801 the first great school of dermatology became a reality at the famous Hôpital Saint-Louis in Paris, while the first textbooks (Willan’s, 1798–1808) and atlases (Alibert’s, 1806–1814) appeared in print during the same period of time. This subspecialty deals with options to view skin conditions over a large distance to provide knowledge exchange, to establish second-opinion services for experts or to use this for follow-up of individuals with chronic skin conditions. Teledermatology can reduce wait times by allowing dermatologists to treat minor conditions online while serious conditions requiring immediate care are given priority for appointments. From 1990 to 2013, skin disease constituted approximately 2% of total global disease disability  as measured in disability adjusted life years (DALYS). ^ Random House Webster’s Unabridged Dictionary. Random House, Inc. 2001. Page 537. ISBN 0-375-72026-X. ^ “Dermatology Procedures – American Osteopathic College of Dermatology (AOCD)”. www.aocd.org. ^ “What is a dermatologist; what is dermatology. DermNet NZ”. Dermnetnz.org. 2009-06-15. Retrieved 2012-10-28. ^ “What is a Dermatologist”. Dermcoll.asn.au. Archived from the original on 2012-05-25. Retrieved 2012-10-28. ^ “American Academy of Dermatology – American Academy of Dermatology”. www.aad.org. ^ Freedberg, et al. (2003). Fitzpatrick’s Dermatology in General Medicine. (6th ed.). McGraw-Hill Professional. Page 3. ISBN 0-07-138076-0. ^ “American Board of Dermatology”. Abderm.org. Archived from the original on 2013-06-10. Retrieved 2012-10-28. ^ Creative Innovations. 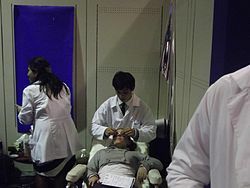 “American Osteopathic College of Dermatology – Qualifications Overview”. Aocd.org. Archived from the original on 2012-10-15. Retrieved 2012-10-28. ^ Wu JJ; Tyring SK. ““…has been the most competitive of all specialties for at least the last 5-6 years.” This is confirmed by data from the electronic residency application service (ERAS)”. Retrieved 2006-06-23. ^ Wu JJ; Ramirez CC; Alonso CA; et al. ““Dermatology continues to be the most competitive residency to enter…” Arch Dermatol. 2006;142:845-850″. Retrieved 2007-06-25. ^ Singer, Natasha (2008-03-19). “For Top Medical Students, an Attractive Field”. The New York Times. Retrieved 2010-05-01. ^ James, William; Berger, Timothy; Elston, Dirk (2005). Andrews’ Diseases of the Skin: Clinical Dermatology (10th ed.). Saunders. Page 895. ISBN 0-7216-2921-0. ^ “Dayton Skin Care Specialists: Fellowship Information”. Daytonskinsurgery.org. Archived from the original on 2012-09-28. Retrieved 2012-10-28. ^ UC Davis Health System, Department of Dermatology (2010-04-21). “ACGMC Procedural Dermatology Fellow”. Ucdmc.ucdavis.edu. Retrieved 2012-10-28. ^ “Best Hair Growth Oil”. Retrieved 24 Feb 2018. ^ “What is dermatopathology? Diagnosing disorders of the skin – David Geffen School of Medicine – Los Angeles, CA”. medschool.ucla.edu. Retrieved 2018-09-06. ^ “DRAFT” (PDF). Retrieved 2012-10-28. ^ “Disease List – U of U School of Medicine – | University of Utah”. medicine.utah.edu. Retrieved 2017-02-05. ^ “About ASMS”. American Society for Mohs Surgery. ^ “The Mohs College Difference”. Mohscollege.org. Retrieved 2012-10-28. ^ “Subspecialty Certification in Pediatric Dermatology”. The American Board of Dermatology. Retrieved October 30, 2014. ^ “Pediatric Dermatology”. Medscape. Retrieved June 22, 2018. ^ “DermNet NZ – All about the skin – DermNet NZ”. www.dermnetnz.org. ^ “telederm.org – dermatological advice on a click!”. www.telederm.org. ^ “Online Visits With Dermatologists Enhance Access to Care for Patients With Minor and Serious Skin Conditions, Boost Physician Productivity”. Agency for Healthcare Research and Quality. 2013-11-06. Retrieved 2013-11-06. ^ Barzilai, DA; Freiman, A; Dellavalle, RP; Weinstock, MA; Mostow, EN (Apr 2005). “Dermatoepidemiology”. Journal of the American Academy of Dermatology. 52 (4): 559–73, quiz 574–8. doi:10.1016/j.jaad.2004.09.019. PMID 15793504. ^ “The global burden of skin disease in 2010: an analysis of the prevalence and impact of skin conditions”. IHME. 1 November 2013. Retrieved 31 January 2017. ^ “Global Burden of Disease”. W.H.O. Global Burden of Disease/en/. Retrieved 7 October 2015. ^ “IHME Data Visualization: Compare”. Retrieved 7 October 2015. ^ Murray, CJ (1994). “Quantifying the burden of disease: the technical basis for disability-adjusted life years”. Bulletin of the World Health Organization. 72 (3): 429–45. PMC 2486718. PMID 8062401. ^ “Liposuction – Who Invented Liposuction?”. Inventors.about.com. 2012-04-09. Archived from the original on 2008-11-07. Retrieved 2012-10-28.